We offer a number of choices for displaying your custom fine art. Everything we do is with longevity and quality in mind. All wall art is sized by the square it fits within, we refer to a 16x20 image as a 20" or 20x20 because it fits within that square. Gallery mounts are a modern and elegant way to display your art without a frame. Your photograph is mounted to a wood substrate and pre-drilled for easy hanging. 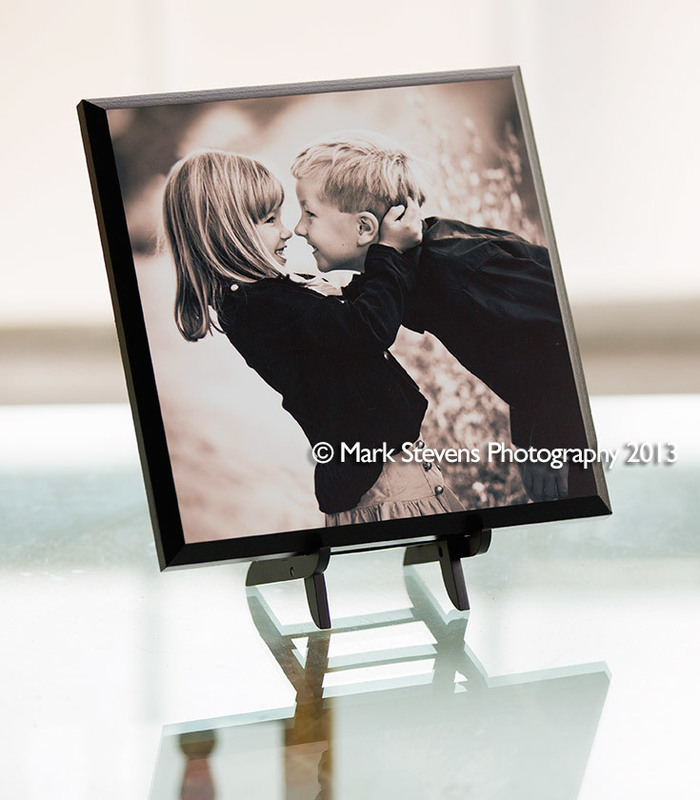 Smaller sizes also make great displays on an easel or in a book shelf. Gift sizes (8x8) start at $98 and make wonderful presents that don't require any additional work. 16x16 Gallery Mounts begin at $319. Our Canvas wraps begin with a rich and thick cotton canvas with no harmful acids or bleach. We choose a fine texture canvas to best present your image Unlike many of the cheap canvases you may find online or with group discounts, our canvases have a true archival life. You can expect great colors and rich black and white presentation for the life of your canvas. Our canvases are both UV and moisture protected to ensure the best display. Canvases are also available framed. 16" un-framed canvases begin at $389. Framed photos are available in many styles to coordinate with your other fine art. Our images are printed on archival fine art paper with special pigments to ensure long life and framed with preservation techniques. We use an extra thick cotton mat around the images for an elegant and enduring presentation. Clear water (low reflection) and UV protective glass are options for any framed piece. We have many standard frames to choose from and a number of upgrade options to fit everyone's taste and budget. Our framed triptychs (three 5x5" images in one frame) start at $289 and a framed 16" image begins at $489. Gift prints, 8x10 and smaller, are available individually or in larger quantities for sharing with your family and friends. We offer both mounted and un-mounted prints on archival art paper. Gift prints begin at $85 and any wall art 20" or larger includes a number of complementary gift prints. The number of prints depends on the size of the wall art. We offer a wide variety of custom designed holiday cards, greeting cards and announcements. Our design services are included with every card purchase and you'll be surprised to find that our cards on rich cotton paper, sleek bamboo paper or elegant pearlescent paper all rival the cost of grocery store greeting cards. Cards are sold in packs of 25 and include envelopes. Non-reproducible copies of any image you purchase are available at no charge when you purchase any form of wall art 16" or larger. All non-reproducible images include our logo. Some clients wish to have digital copies to protect their investment. Your images will be archived (in multiple locations including a fire resistant safe), please rest assured that we've got you covered in the rare event you need a backup or replacement. To ensure the highest quality and longest life we prefer to create your artwork for you. We have often found that other printers don't exercise the care or take the time that we do when making reproductions. If you are certain that you would like to be in charge of your own reproductions we offer those who invest $1500 or more in wall art and gift prints the option of purchasing one digital image for $250, five for $699 or your entire session for $1585. If you prefer to have only digital files you may purchase your favorite five retouched and ready to print images for $1585 or your favorite 30 for $3299. It is important to note that none of our print, wall art or social media offerings include reproduction rights. Reproducible digital files may not be manipulated in any way or used to make or inspire derivative works. It is a violation of federal law to duplicate any image without written permission.